Researchers: Marino Protti and Victor González, Observatorio Vulcanológico y Sismológico de Costa Rica (OVSICORI), Andrew V. Newman and Jacob I. Walter, Georgia Institute of Technology, Timothy H. Dixon and Rocco Malservisi, University of South Florida, Susan Y. Schwartz, University of California Santa Cruz, Jeffrey S. Marshall, Cal Poly Pomona, Lujia Feng, Earth Observatory of Singapore, and Susan E. Owen, Jet Propulsion Laboratory. The Nicoya Peninsula along the west coast of Costa Rica has experienced magnitude 7 or larger earthquakes about every 50 years since the mid-1800s. These earthquakes break along a major subduction zone driven by the rapid collision between the Cocos and Caribbean tectonic plates. International cooperation supported strategic observational networks and joint research of the complex plate boundary yielding a detailed image of where another large magnitude event might occur. On 5 September 2012, a magnitude 7.6 earthquake broke within the anticipated region. Thankfully there were no fatalities and limited economic loss because of preparation, resilience, and knowledge of the tectonic risk. The established geodetic, seismic and geologic monitoring delineated the area and amount of deformation caused by the earthquake and identified a possibly still locked segment further offshore that may rupture in a large event in the future. Costa Rica sits at the complex intersection of tectonic plates. The primary interaction is the Cocos plate colliding with and diving down under the Caribbean plate and Panama Block. This interaction has created an active subduction zone boundary that approximately parallels the western Costa Rican coastline. The adjacent Pacific, North American and Nazca plates contribute to the dynamic changes and poorly defined microplates further complicate the tectonic processes. Together these plate collisions generate the volcanoes, mountainous topography and earthquakes that pervade the beautiful landscape of Costa Rica. The Nicoya Peninsula in northern Costa Rica juts out into the Pacific Ocean and provides a unique on-land platform for GPS and seismic instruments to monitor activity along a portion of the subduction zone that generates large earthquakes. Most major subduction zones are far from land, making them more difficult to study. The seismic network recorded several foreshocks, the main shock as a thrust fault consistent with Cocos plate motion down and to the northeast relative to the Caribbean plate and aftershocks. 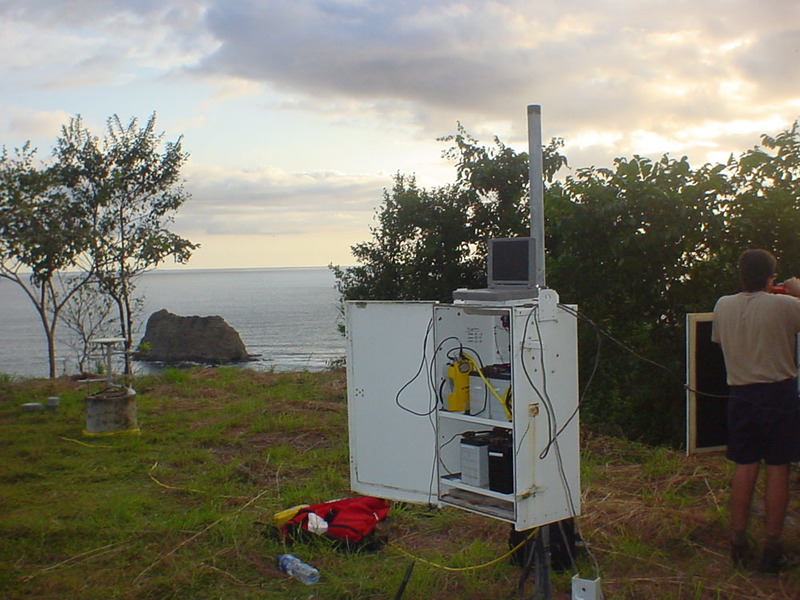 GPS measurements recorded coastal uplift of as much as 53 centimeters and west to southwest horizontal displacement of as much as 68 centimeters. These GPS results, along with field observations of coastal uplift, can be explained by about 4 meters of thrust and 1 meter of right-lateral motion along a portion of the subduction zone that was previously observed as locked and building toward failure. The area that ruptured during the earthquake was smaller than the modeled locked section. 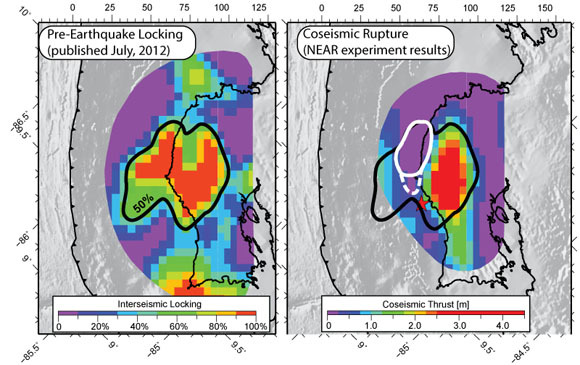 The remaining locked section may fail in another earthquake or through less intense fault creep. Continued monitoring can help to determine if the locked segment relieves any stress through small earthquakes or builds up stress for a potentially large earthquake. Thankfully international cooperation and wise investments by Costa Rica in geoscience and technology have allowed for robust observational network over time for greater understanding of earth processes and greater risk resilience for society living along an active plate boundary. 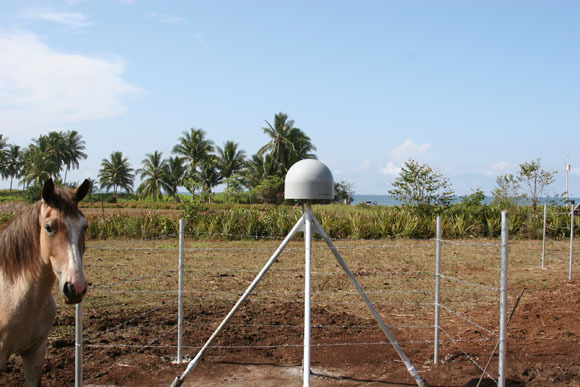 A similar effort to build an observational network is now starting at Osa peninsula in southern Costa Rica where a large earthquake is expected in the next 10 to 15 years. M. Protti, V. González, A.V. Newman, T.H. Dixon, S.Y. Schwartz, J.S. Marshall, L. Feng, J.I. Walter, R. Malservisi, S.E. 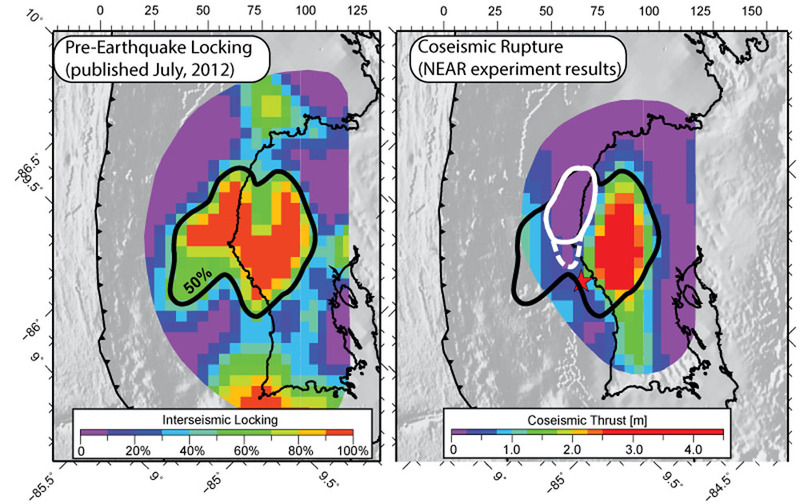 Owen (2013), Nicoya earthquake rupture anticipated by geodetic measurement of the locked plate interface, Nature Geoscience, DOI: 10.1038/NGEO2038. 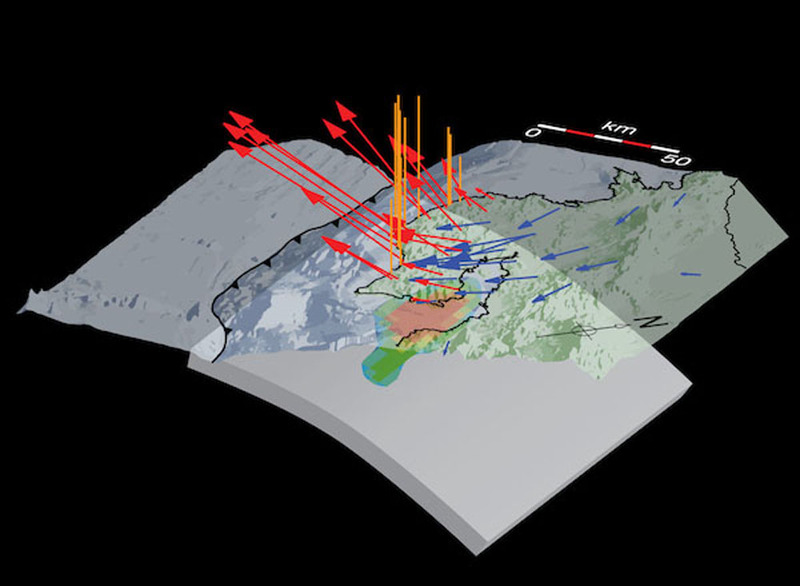 Feng, L., A. V. Newman, J. M. Protti, V. González, Y. Jiang, T. H. Dixon (2012), Active Deformation near the Nicoya Peninsula, Northwestern Costa Rica, Between 1996 and 2010: Interseismic Megathrust Coupling, J. Geophys. Res., 117, B06407, DOI:10.1029/2012JB009230. Send questions or comments about this page to Linda Rowan rowan unavco.org.